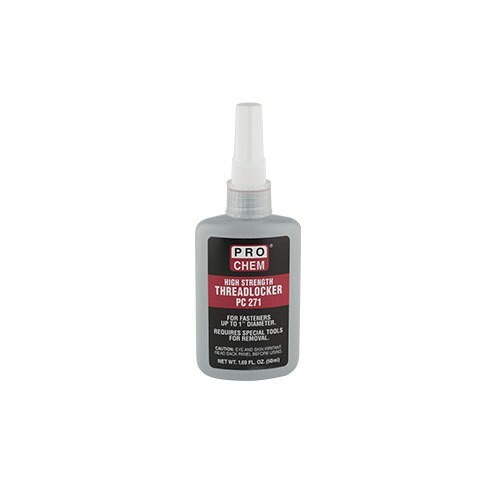 THREADLOCKER PC 271 | Pro Chem, Inc.
THREADLOCKER PC 271 is a high strength adhesive for locking and sealing all fasteners up to 1” in diameter. It is used where severe applications are evident or for tamper-proofing where a difficult removal is desired. It is especially suited for permanently locking studs and press fits. Curing occurs only when adhesive is confined between mating surfaces. The cured adhesive will withstand temperatures up to 300°F and exposure to most fuels, lubricants and most industrial gases. Requires extra or special tools for removal. Suitable for fasteners up to 1” diameter. Performs well on aluminum, steel, plated fasteners, stainless steel and special alloy parts. Ensure parts are clean, dry and free from oil and grease. Twist off white over cap and snip nozzle to desired length. Hand apply from the bottle onto threaded parts and assemble. High strength special tools are required for removal. The application of heat may be required to assist in removal.